The gazetteer is compiled from small and larger databases from different sources. Most important are the records from the RMNH and KSP collections and the gazetteer from the former National Herbarium in Leiden (The Netherlands, now Naturalis Biodiversity Center) and Allen Allison, Bernice P. Bishop Museum (Hawaii, USA). In many cases coordinates from different sources for the same localities may differ. In those cases we kept both records in the database, realizing that there must be quite some double records. Some coordinates are in DECIMAL numbers instead of minutes and seconds! Decimal numbers are recognized by the many figures behind the COMMA. Coordinates with minutes are recognized by the degree symbol and a maximum of two figures behind that symbol, like 130°47. The letter "u" was in the former Dutch spelling "oe". It may be wise to search in both spellings. The letter "j" was in the primary Indonesian spelling till 1970 "dj", "j" became "y", "tj" became "c" and "c" became "k". It is advised to search for both possibilities. Some geographical names (i.e. rivers, areas) are mentioned with more than one coordinate combination. In those cases the river or area is too wide to point at one coordinate. In some cases coordinates nor the area can be given, since only the geographical name is known (in most cases from labels or literature). If you have additional information on those names we would be very thankful if you would let us know. Most names are gathered from databases compiled with collection (label) data and from literature. 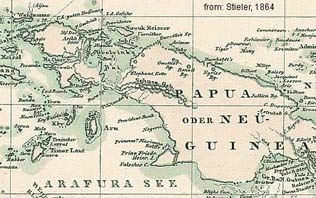 We attemp to mention all possible geographical names of Papua, but you will understand that this will take time or even be an utopy. We ask for your understanding that the gazetteer will be under continuing construction. Some localities may be double or more mentioned. This is caused by the different origin of databases which are just put together for the moment in our gazetteer. In future we will undouble these records. The information is free to use. In case of use for publication we appreciate a reference ("Papua Insects Foundation") of this source in your publication and a notification to us of your publication.